For months, I haven’t been able to write. 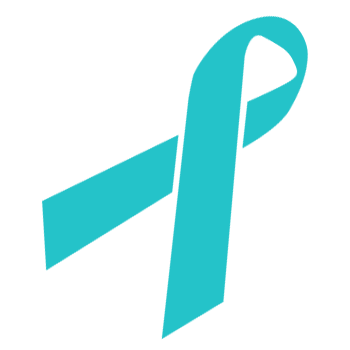 I’ve started a dozen posts, I’ve made quick journal entires, I’ve jotted things down on sticky notes, but that’s it. Sitting down and composing a coherent post, full of ideas relevant to dysautonomia, relevant to my life, relevant to anything—has been impossible. Life has been four million different types of hectic since the holidays. Acting on things has been HARD. Starting is one horrible, terrible, impossible task. And finishing? UGH? How is anyone supposed to finish anything? Which is why I just have to bite the bullet amid all the craziness—the chronic illness, the wild of life and even normalcy—and do the damn thing. It won’t be shiny and perfect like I want it to be. But the first cut is the deepest because of that terrible first pancake and all of those other clichés. Get the first one out of the way and the other ideas will follow. You know all those fun phrases. It’s not enough to just write the post though. Write the post. Edit the post. Publish the post. Add a picture. Tweet the link. Tell a couple of people. The mantra is relevant to everything. 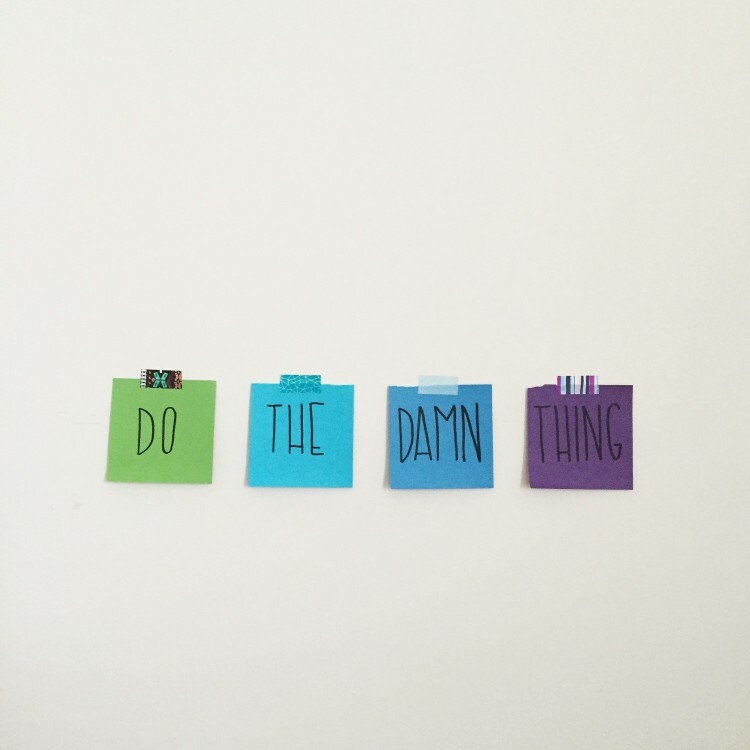 Do the damn thing—that’s how I (we, everyone) tackle so many things. It’d be nice to be sunshine and rainbows all the time. It’d be nice to hop out of bed in the morning at 7 or 8, run downstairs, get a bowl of cereal, exercise and start tackling and achieving. It’s not though. It’s usually a series of do the damn thing. They’re not necessarily the first, ideal choice. But they get you somewhere. I’m not supposed to, but I hit the snooze button a lot. I usually grab the granola bar I left on my bedside table the night before and eat it while I’m still asleep so it will wake me up. From that point on, my day varies. It always consists of exercise on my recumbent bike (the time of day varies). I often find myself in doctors’ office waiting rooms. The daily task difficulty varies. Making a sandwich for lunch? Easy. Watching Stephen Colbert? The easiest! Clearing the docket makes way for the good. And even the good doesn’t have to be perfection, it just has to be enough to feel better. This is my very short formula for explaining dysautonomia to others. It’s been working out pretty well for me, and hopefully it’ll work well for anyone who needs any help. My explanation for dysautonomia changes and develops weekly, just as my dysautonomia does. This illness isn’t static, it changes as frequently as I do. I have cardiac/neurological condition called dysautonomia where my autonomic nervous system which controls a ton of automatic functions gets very confused. The ANS controls your heart rate, blood pressure, digestion, et cetera. My subtype is called Postural Orthostatic Tachycardia Syndrome, and the most noticeable symptom is that every time I stand up, my heart rate jumps up at least 30 BPM, which is twice what it should. With so many things out of balance in my body, it causes extreme fatigue, brain fog, digestive issues, cardiac problems, body aches, and a ton of other problems. In writing, it looks like a lot. But when you say it out loud, it’s not that bad. If someone gets bored listening to you explain a very complicated illness in 4-5 sentences, they’re probably going to get bored listening to everything else you have to say. Feel comfortable with the words that you’re saying–if you feel comfortable using some doctorly words, go for it, but don’t forget who your audience is. So all of these symptoms are listed, and someone can guess what it means for your life, but help them understand it further. What does it mean to have your heart rate jumping up 30 BPM all the time? What does brain fog mean for you versus someone else? Because of the dizziness, I have to be very careful every time I stand up and with every step I take. I have a lot of concentration problems and now have to take a reduced course load at school. No matter how much I sleep, I’m still fatigued most or all of the time. I’m on a high salt, high fluid diet in addition to taking several different medications at various times throughout the day. I have to use a seat in the shower because the hot water aggravates my symptoms. Make sure the person listening can see themselves in the place of a POTSie (or any other dysautonomiac). If you want to, you can really open up, or you can keep it surface level. It’s all about what feels right for you. Share your goals and hopes for dysautonomia. I usually share my “next step” for treatment or my latest update. I’m trying a new medication and it’s supposed to help increase my blood flow and fatigue. My new exercise plan includes physical therapy so I’ll get some support there. Leaving things open-ended with your dysautonomia story is almost more true to the spirit of this illness: none of us know where this is going because there is no cure yet, there are no ultimate answers for what to do to treat it beyond hydrate, salt, and exercise. Above all else, go with what feels right when explaining your story. Share everything or share nothing, as long as you feel good about it. Happy holidays and happier holiday shopping, my dear followers! If you’re like me, the whole holiday season gets mixed up because it feels like it starts in October. That means you don’t know when to start buying presents and it gets put off over and over again. If you need to be told like I do, NOW is a good time to start thinking about it. And if you have a loved one with dysautonomia on your shopping list, I’m here to help. 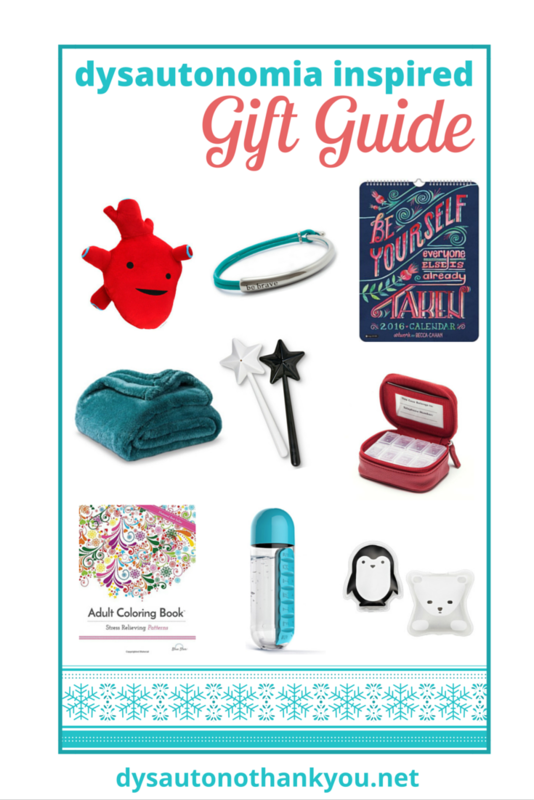 I chose a bunch of fabulous dysautonomia friendly/dysautonomia inspired gifts, but keep in mind, people with dysautonomia have a 99.9% chance of enjoying what all non-NCS, non-POTS, non-AAG, non-every-other-form-of-dysautonomia patients would enjoy. When in doubt, go for what is truly and essentially them. And most of the time, that is Netflix subscriptions, iTunes gift cards, or just cash. I know Emily Post would probably frown upon cash gifts, but she died in 1960, and I’m the one with the blog. I did not receive any kickbacks for these recommendations but I would totally appreciate them if anyone’s offering. 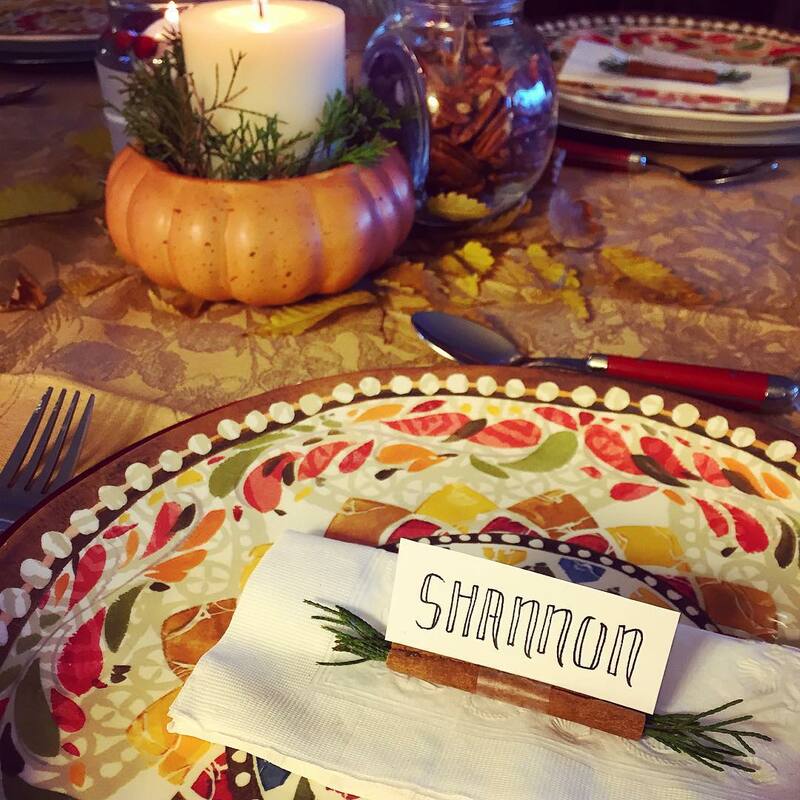 SO, AT LONG LAST, HERE ARE SOME DYSAUTONOMIA INSPIRED HOLIDAY GIFTS. “I hate your guts” is a pretty different phrase from the original playground insult when you’re saying it to someone with internal organ dysfunctions. But what if you learn to love the things you hate because someone has made them into adorable cartoon stuffed plushes? That’s what artist Wendy Bryan Lazar did, and now we can all make peace with our messed up hearts, brains, colons, you name it because of it. These are some of the world’s cutest bracelets and necklaces and I should know, I spend a lot of time lurking on jewelry websites. We sell them at the Dysautonomia International patient conferences and they’re such a huge hit because they’re simple but bold. Bonus, $10 of every purchase goes to Dysautonomia International! Keeping your bedroom clean and decorated is hard when you have little to no energy, and calendars are the easiest way to refresh your bedroom decorations: each month, flip the calendar, new artwork. Whether the person you’re shopping for likes to to adorn their walls with inspirational quotes, snarky sayings, or illustrations of animals, there’s something out there for them to keep a smile on their face. Blankets are the perfect gift. Non-denominational winter holiday? Blankets! New house? Blankets!! Bought a new blanket? MORE BLANKETS!!! One of the first things that goes away with dysautonomia is your ability to regulate your body temperature, so blankets really are the perfect gift. Some of us are freezing all of the time, some of us are constantly sweaty, and some of us (me) vacillate drastically between the two. It’s good to have blankets on hand. Many dysautonomia patients are put on high salt diets to help increase their blood volume. Adding salt to every meal gets very old very quickly, so why not give them the gift of livening up mealtime? I take the majority of my medications when I wake up and go to sleep, but I need to carry five prescription medications with me during the day at all times. I’m an average POTS patient, if not on the low side. Finding the right way to carry meds is critical and takes a lot of trial and error. Some containers work great until they spring open on a trip and you lose half of your meds because they get crushed underneath your laptop. My favorite container I’ve ever used is a standard pill container inside of a zip holder from Khols. My mom got it for me for Christmas last year and it’s the envy of my fellow chronic illness friends. It’s compact and easy to describe to people when I misplace it and need help finding it. Novelty pill containers are fun, too! The Container Store is a gold mine of exciting items. When you’re on a ton of medications, you can never have enough pill containers. A few years ago, publishers finally figured out that adults like coloring, too. Now, it’s a THING and we can take the time to unwind and have mindless fun relaxing, thinking about nothing, and making things that look nice. Everyone deserves some peaceful time. While you’re at it, throw in some nice colored pencils and maybe some nice markers. At the Dysautonomia International conferences, doctors had three key pieces of advice for treatment: exercise, add salt to your diet, and drink water. Drink so much water. Drink it until your pee is clear and then drink some more water. With all of the hydration that goes on, dysautonomia patients need water bottles and lucky for gift givers, there are eighty billion different kinds out there. I recommend going for larger capacity bottles, generally the 32 fl oz bottles, and getting a spout that is protected from the germy elements. Back to the temperature control thing: people with dysautonomia have none. Especially in our extremities. Bonus, we have a lot of pain, all the time. It’s nice to heat or freeze our joints or necks or bruises or whatever it is that’s in pain. So give someone a cute one because we’ve had enough of ugly. Remember, gifts are always about what the recipient would appreciate it. Is it something they want? Is it something they need? Is it something that would make them laugh or smile? Plus you can always take a play from my family’s book: when in doubt, throw in their favorite food. So happy, happy shopping and happier gift giving! And please share your favorite go-to gifts or the best gifts you’ve ever given/received in the comments! Dysautonomia International knows how to party. They know that #GivingTuesday is the best, and want to make it last every day of December. I used to think of charity in the abstract. I participated in service projects, I bought wristbands, I practiced my vocab to donate grains of rice. I gave $5 here and there as a kid to my church humanitarian fund, I read books to some kids, and I baked some cupcakes. Y’know, charity. But none of these left a lasting impact on me. But now that nonprofits like Dysautonomia International are one of my major support networks, I’m learning how important it is to find one that means something, anything to you, and to be involved in any way, shape, or form. And whether it *is* buying a wristband, whether it’s baking some cupcakes, whether it’s donating $10—as long as it’s FOR something greater, something that means something to you, that’s meaningful. 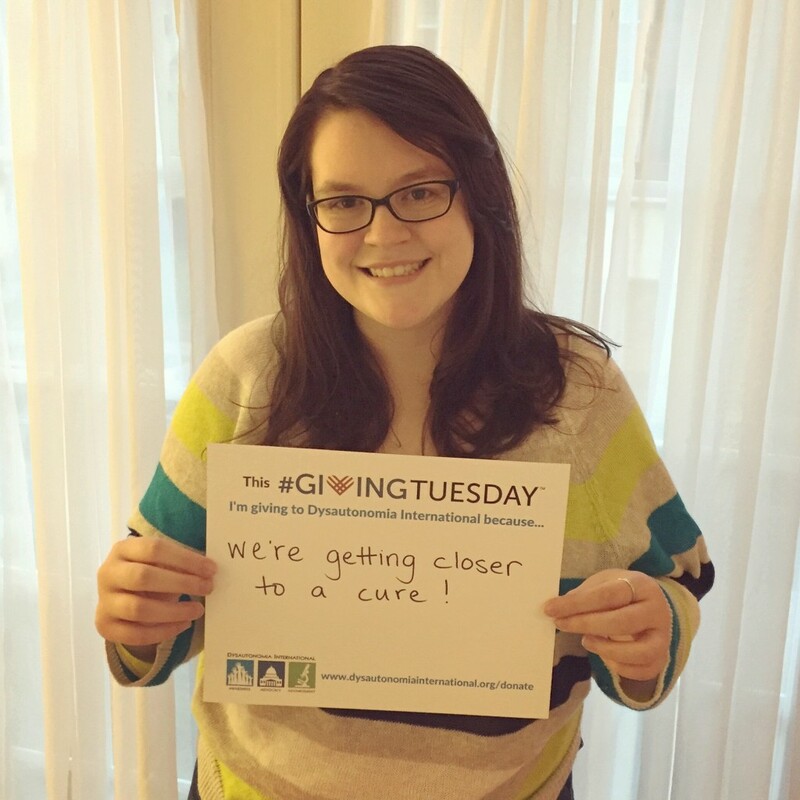 I’m giving what I’ve got to Dysautonomia International for #GivingTuesday and the month of December because they’re looking to expand their physician education programs, and I’m really excited about that! I cannot wait for the day that all of my doctors are familiar with dysautonomia and POTS because despite all of my studying, I do not always understand medical terms, I can only guarantee that I understand what I feel and experience in my body. I cannot wait for doctors to be educated so that other people can get diagnosed quickly and will not have to wait a decade like I did. Physician education is such an exciting project, because it brings us one step closer to everyone’s goal: a cure for dysautonomia. A week before Thanksgiving, I had a very serious #throwbackthursday and actually threw my back out while shopping at Wegmans. I squatted down to get some marshmallows and nothing has been the same since I stood back up. I’m still in a lot of pain on and off two weeks later (I think I might have sciatica) but people are being very kind to me and letting me take it easy. As tacky as it sounds, throwing my back out has been a little bit of a learning experience. I might be one of the cockiest people in the world when it comes to asking for help. I generally equate going to therapy and going to my other eight million doctors as “asking for help.” But I’m full of crap, because I forget that there are so many other opportunities in life to ask for help that everyone should take advantage of in order to be happy and functional human beings. There have been a few opportunities where my back was hurting more than I thought possible, spasming out with every step I take, and my mind has been screaming “ASK FOR HELP. TELL WHO YOU’RE WITH THAT YOU CAN’T KEEP WALKING.” but for some reason I just didn’t. There was such an internal war going on that I thought about for a long time afterwards—I was with people that I knew cared about me, why didn’t I tell them just how bad things were? Why didn’t I tell them that the pain made me think I was going to throw up? Why didn’t I speak up? I realized that it was all out of fear. I was afraid that they wouldn’t understand. What would happen if I got vulnerable, told them how much pain I was in, and they didn’t care? In one of those moments, I subconsciously decided that I wasn’t prepared for the potential pain of them not understanding me and went to suffer in silence aside from the sharp inhales of breath I couldn’t contain. In retrospect, given the people I was with, I wish I had spoken up. I was with people who loved me. I was with people who have taken the time to understand me, understand my pain. And worst case scenario, if I asked for help, if I told them I was in pain and they didn’t get it, would the world stop turning? Would they stop caring about me? Would it mean we don’t have fun together? Absolutely not. It would just mean that this isn’t one of the things that we are all on the same page together on. And that’s OK. Because none of us are going anywhere. What matters is that I know I have the option of speaking up and asking for help when I need to.